Researchers from the University of Southampton are aiming to develop a ‘smart’ thermostat to help UK households save money on their energy bills. The prototype autonomous device allows users to control their heating based on the price they want to pay rather than setting it by temperature alone, which existing smart thermostats such as Nest, do. 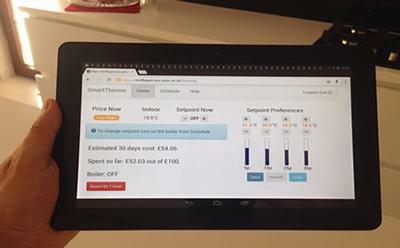 To understand how users interact with smart energy systems, a team of researchers from Electronics and Computer Science (ECS) at Southampton and the University of Zurich produced three different smart thermostats that automated heating based on users’ heating preferences and real-time price variations: a manual one through which participants explicitly specify how the heating should respond to price changes, and two learning-based ones that employed an artificial intelligence (AI) algorithm to automate the temperature settings based on learned households’ preferences. The designs were tested through a month-long field study involving 30 UK households. The energy price was changed every 30 minutes, which could be viewed by the participants. The results showed that participants used all three thermostat systems to effectively manage their home heating and create temperature preferences based on real-time prices. However, following interviews with study participants it was clear that the price was not only the factor that users considered for heating their home. Other key factors were outside weather, occupancy and daily activities within the house. Some participants explicitly stated that the use of the thermostat could be more convenient if it could learn their occupancy patterns. Also, outside weather and the activities that they perform during a day within the house have a significant impact on how people feel the indoor temperature. The study will be presented at ACM CHI 2016, the top conference for Human-Computer Interaction in San Jose, United States, in May. The research was funded by the Engineering and Physical Sciences Research Council (EPSRC) through the ORCHID and CharIoT projects.